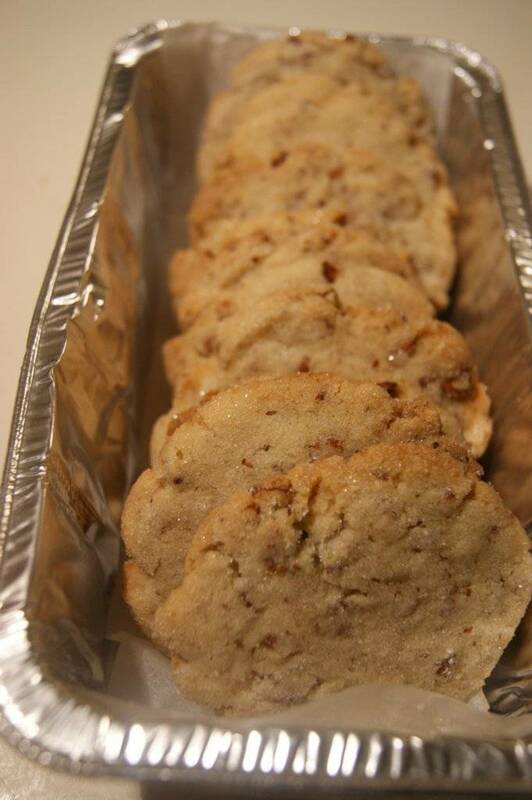 I made these the first time only because I wanted to use up some pecans. I made these the second and subsequent times because they Are. So. Good. 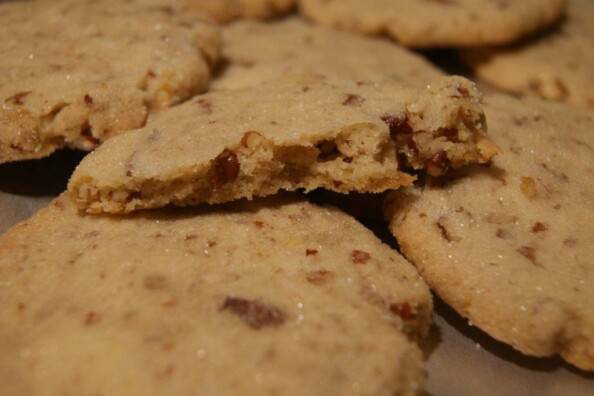 These cookies are beyond good when made with baby native pecans from Rancho Vignola. Anyone who read my last post will know that I am a huge fan of Rancho Vignola’s products in general. In particular, I love the sublime freshness of their “new crop” nuts. The sweetness of the almonds and hazelnuts, the crisp butteryness of the walnuts, and the unbelievable flavour of the baby mini native pecans. Aren’t they cute? Just the size of my thumbnail (and I have small nails). I don’t think I ever knew what a pecan was supposed to taste like until I tried the native pecans. But don’t let a lack of boutique nuts deter you from trying out this recipe. 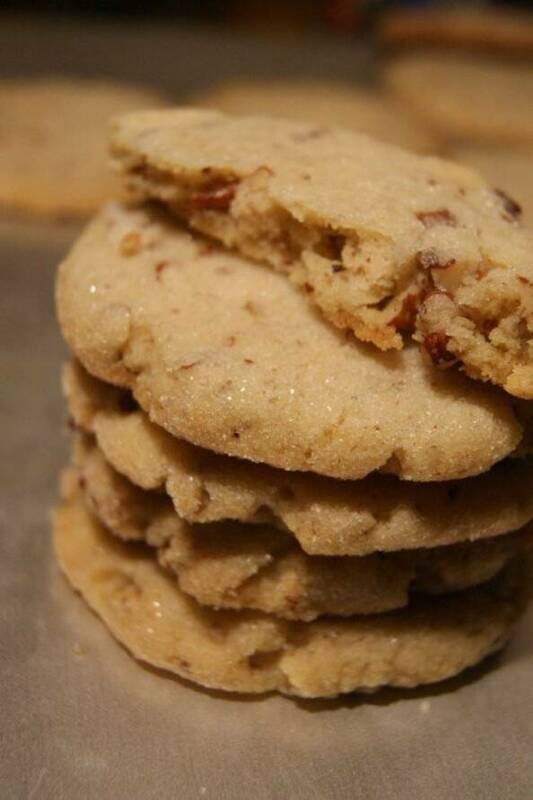 Way more nutty than Mexican wedding cakes, more buttery than shortbread, yet simple as all get out to make, this is a great recipe for even supermarket pecans. Which I have used, by the way, since my baby pecans are the one nut I can never buy enough of to last the whole year. Makes 12 large cookies pr 16 medium. Recipe doubles easily. 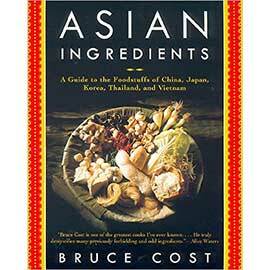 Adapted from Every Day Food, 2007 collector cookie edition. 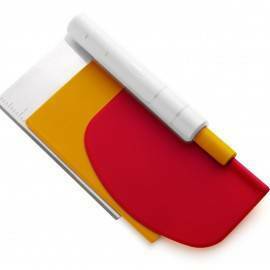 Preheat oven to 350 F. Line a large cookie sheet with parchment paper. 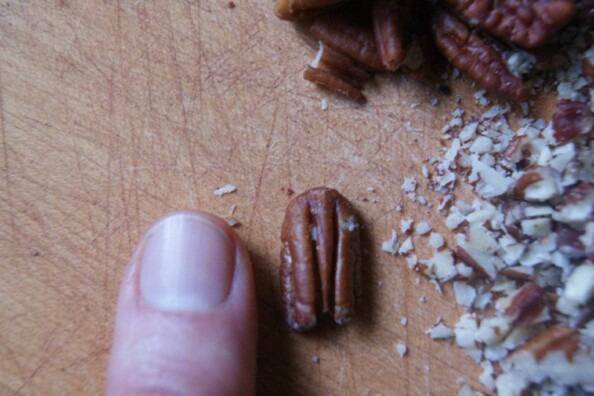 Place pecans on a separate baking sheet. Place in the oven and toast pecnas, stirring once, until fragrant, about 6 minutes. Remove from oven and let cool. 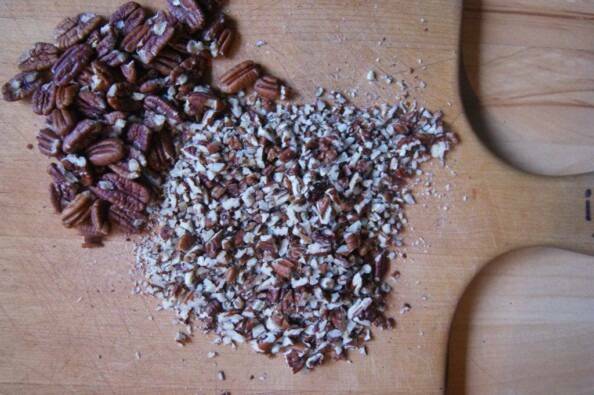 Finely chop pecans and set aside. In a medium bowl, beat butter and 1/3 cup sugar together, using either a wooden spoon or an electric mixer, until light and fluffy. Beat in vanilla. In a small bowl, whisk together flour and salt. Add this mixture to the butter mixture and mix together until dough comes together. Add pecans and mix well. Divide dough into 12 to 16 equal pieces. Roll dough into balls. 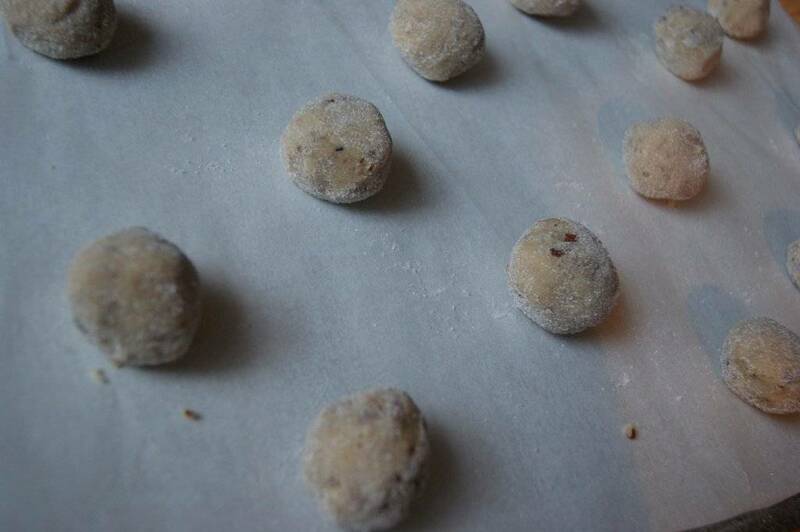 Roll each ball in sugar to coat and place on parchment-lined cookie sheet, leaving about 2 inches between each dough ball. Gently flatten each dough ball with the bottom of a drinking glass (dip the bottom in sugar first). 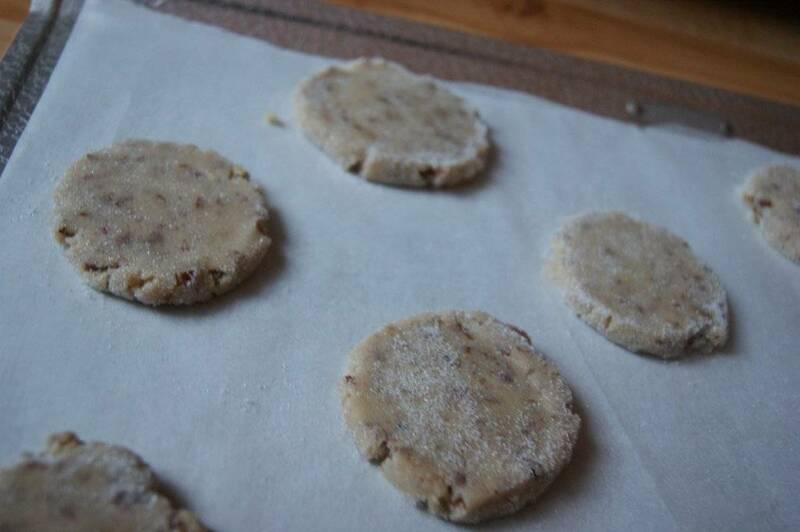 Place cookie sheet in the oven and bake until light golden brown, about 12 to 15 minutes. Transfer cookies to wire rack to cool completely. 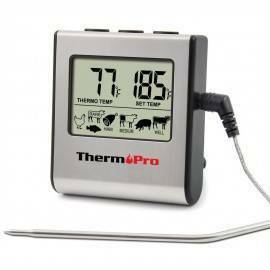 Store in an airtight container at room temperature up to 4 days. I’m going to try making these today. Do you think I could substitute the wheat flour with oat or bean flour? Thanks for sharing … again! So good Heidi!! Thank you for posting. I have made two double batches this week!! All credits going to you!